The Nile Basin Development Challenge (NBDC) and the wider Challenge Program for Water and Food tried out several communication tools and approaches to make its research more useful and more likely to be used. Among these tools and approaches, digital stories or photofilms) have proven to be great ways to place stories and human lives at the core of our work and thereby to capture and communicate the research we have conducted in more effective ways. Digital stories help bring a lively and authentic feel to the stories shared. They can be used at field level for real life stories, as well as at higher levels to summarize conceptual work in a simpler way. The latest NBDC technical report is an introductory guide to help people use photos, videos and audio files to develop such digital stories. The guide was produced for internal use by the Nile Basin Development Challenge (NBDC) but has wider usefulness. The guide explains how to make a digital story. From interviewing and photographing to editing the pictures and audio-recordings and finally merging image and sound. Communication and knowledge management (KM) are among the pillars of the ‘Research for Development’ (R4D) approach of the Nile Basin Development Challenge and the wider Challenge Program for Water and Food (CPWF), as the recently published NBDC institutional history stressed. On 2 and 3 December 2013, the CPWF organized a workshop on communication and knowledge management to review the results of CPWF in these areas. The workshop involved twelve participants from the six basins involved in CPWF (Andes, Ganges, Limpopo, Mekong, Nile and Volta), mostly communication/KM specialists but also the basin leaders for the Andes and Limpopo basins and an external consultant. Over the two days, they presented their communication and KM work and teased out some stories that illustrated the successes and challenges of each Basin’s experience. Finally, the group collectively developed a series of a) specific innovations that they thought were excellent examples that might be applied elsewhere and b) lessons and principles that matter for CKM to be performing better in wider programs. Following this workshop, Michael Victor, the communication and knowledge management coordinator for CPWF was interviewed by Ewen Le Borgne to reflect back on the objectives and results of CPWF and NBDC. Ewen Le Borgne (ELB): What did CPWF set out to do with communication and knowledge management? When I arrived as a ‘comms guy’ I wanted to show that communication is not just about stories, but in CGIAR there was a lot of segmentation and silos. Boru Douthwaite (then head of CPWF Innovation and Impact) was very visionary about the integration of KM, comms, information management, monitoring and evaluation (M&E), so we had this great idea about integrating all these domains, wondering how to work together with people working in these related domains. And we struggled with that. We had a breakthrough meeting in 2012 where we started to see that learning was in the middle. The tools used in M&E (e.g. Outcome Mapping, Social Network Analysis) are not exclusive to it, they can be used for a whole series of purposes. There was recognition that we were bringing different expertise around similar tools. What we set out to do was to develop this overall approach, recognizing that we were moving towards programmatic approach to KM. this meant that different aspects of KM (M&E, Comms and Info) were seen as a strategic function helping research get to outcomes, rather than as administrative or support functions. (ELB): What worked and what didn’t, generally? (MV): By the end, what worked well was this blurred boundaries approach. Everyone recognizes the role of KM in R4D, it’s very clear. That worked really well. Our whole decentralized approach worked really well, having this range of KM approaches across different basins, and how it came together was very valuable. What didn’t work very well was moving communication activities beyond products and making sure they are seen as part of a wider change process. We also did not evaluate and monitor our KM activities that well. The ‘learning’ or research on these aspects were weak and therefore has been difficult to show the benefits of this approach. Perhaps also the comms side came off too strong, while other people (e.g. some basin leaders) wanted to understand the KM process behind this work. (ELB): Specifically about the NBDC? (MV): When I started, I wanted to build upon the initial basins that were already developing their systems. Peter Ballantyne had this great approach of using NBDC as an experiment. I realized he had a vision and had the tools to do it. So I piggybacked what Peter did e.g. with CGSpace, rolling out wikis. NBDC were the first basin to roll out with the Mekong (and Andes). From the Mekong we also took ideas related to branding and identify (where the basin logos came from). No other basin was developing anything replicable. NBDC was trying things in their institutional context, linking with innovation platforms, embedding comms and KM in the basin etc. (ELB): How do we capitalize on the NBDC and CPWF work on communication and knowledge management? (MV): What we did last week (i.e. with the kmc4CRP workshop): Working with CGIAR Research Programs and focusing on one-on-one, face-to-face interactions, making sure that we have the stories readily accessible. We should try to get – whenever we can – other people to use existing websites, wikis etc. disseminating strategically. Digital storytelling refers to short films composed of digitized still and moving images, sound and text. This is a highly effective way of presenting compelling stories in an engaging format. Digital stories can be created by people everywhere, on any subject and shared electronically. In November 2012 ILRI research staff attended a digital story workshop run by UK-based trainers Tracy Pallant and Katrina Kirkwood. The training was organized by Beth Cullen, Kindu Mekonnen and Alan Duncan as part of a joint project between UNEP, ILRI and Wollo University titled “Enhancing communities’ adaptive capacity to climate-change induced water scarcity in drought-prone hotspots of the Blue Nile basin, Ethiopia” working in the Kabe watershed, south Wollo. 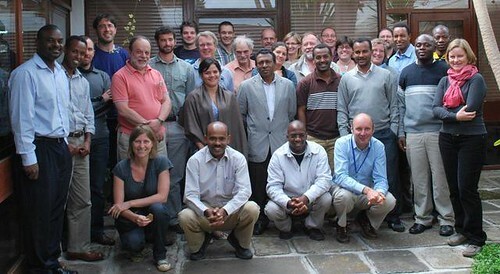 The training was attended by UNEP project members Kindu Mekonnen and Derbew Kefyalew. They were joined by Aberra Adie, Zelalem Lemma and Gerba Leta, involved in the Nile Basin Development Challenge (NBDC) project, and Zerihun Sewunet, a member of the ILRI Knowledge Management and Information Services (KMIS) team. The training focused on identifying suitable stories, interview techniques, audio recording, basic photography skills, audio and visual editing and web-based publication. Participants used digital material collected from the Kabe watershed to document lessons and experiences from the project and spent a day in Jeldu collecting stories from farmers involved with the NBDC innovation platform work. ILRI staff who received the training will now be able to use digital storytelling techniques to document and communicate research processes as well as outcomes. It is hoped that the use of digital stories will enable ILRI to communicate research work to a range of audiences in an accessible and creative format. ILRI researchers are also experimenting with the use of digital stories for participatory monitoring and evaluation. Led by Beth Cullen, a post-doctoral scientist specializing in participatory research methods, cameras have been handed out to community members and development agents in three NBDC sites: Diga, Jeldu and Fogera. The aim is to use participatory photography to monitor the progress of pilot interventions planned by local level innovation platforms. ILRI research staff will work with innovation platform members to create digital stories using their photographs and interviews to capture experiences and lessons learned. These stories will be used to share knowledge between the three sites, between local and national actors and between farmers and researchers. The Nile Basin Development Challenge (NBDC), funded by the CGIAR Challenge Program for Water and Food (CPWF), is currently working with innovation platforms to improve the resilience of rural livelihoods in the Ethiopian highlands through a landscape approach to rainwater management (RWM). Rainwater management interventions in Ethiopia have historically been implemented in a top-down fashion and this has led to several challenges to effective implementation, often revolving around issues of participation. In this basin, we have established three platforms, Diga and Jeldu in Oromiya region and Fogera in Amhara region. The aim of the platforms is to bring a range of stakeholders together to identify technical and institutional challenges around RWM, enhance communication, coordination and knowledge sharing and develop joint action to bring about change. Stakeholders include local government administration, members of the bureau of agriculture, national research institutes, a local NGO and community leaders. However, more needs to be done to ensure that community views are adequately represented. 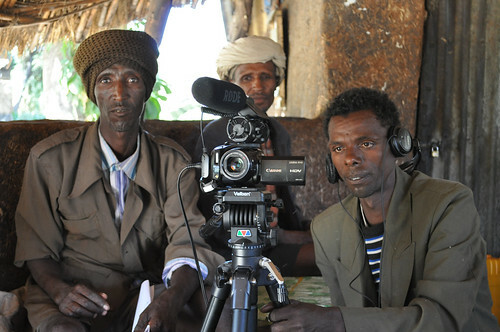 In 2011, CPWF awarded a grant through its Innovation Fund to investigate and document the effectiveness of participatory video (PV) as a tool to bring local issues to the attention of planners and implementers of rainwater management interventions in Ethiopia. 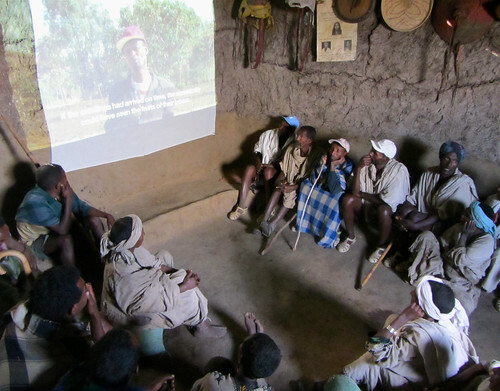 The resulting participatory video made by community members from three kebeles in Fogera woreda was recently shown to members of the Fogera Innovation Platform (IP). The video, titled ‘A Rope to Tie a Lion’, captures community views on land and water management and focused on three issues: unrestricted grazing, water stress and government-led soil and water conservation work. See here for more information about the PV process we followed. The film received a positive response from members of the innovation platform who seemed to gain some insight into community perspectives. A national researcher stated ‘We have a lot to learn from community members. I have now come to realize that the farming community is capable of identifying problems and indicating solutions’. A member of the woreda administration said ‘Today I have come to realize that farmers can play a role in solving their problems by participating actively. It is advisable to keep involving farmers in discussions, they should participate in all stages, from planning and preparation to implementation’. Many of the IP members expressed surprise at farmers’ ability to handle video technology. One stakeholder said ‘I never imagined that they had the capacity to acquaint themselves with technology so fast. I am amazed to see farmers handle the cameras with such competence’. However, the novelty of seeing a video produced by farmers may have overshadowed the messages being expressed. The extent to which IP members really listened to the content is uncertain, but it has been a useful first step towards increasing community voice within the platform. In discussions following the screening, IP members decided to pilot area enclosures and back-yard fodder development to address the issue of ‘unrestricted grazing’. Restricting the movement of livestock was prioritized because livestock are considered to contribute to land degradation and impact negatively on the soil and water conservation measures currently being implemented by the government. However, if restricting grazing is to be feasible, alternative sources of fodder must be provided. A specific micro-watershed was selected by the platform with the aim of enclosing part of a communal grazing area to grow fodder that can be cut and carried to surrounding homesteads. Sufficient amounts of fodder cannot be produced from the selected area alone, therefore farmers will be provided with additional fodder plants which they can plant at their homesteads. The hope is that these interventions will enable farmers to gradually move towards keeping their livestock at home rather than allowing them to graze freely and so contribute to better land and water management. IP members also believe that better feeding and livestock management strategies will improve the livelihoods of community members. However, as the video demonstrates, restricting grazing is a controversial issue that will be hard to tackle due to differences in perspectives between farmers and decision makers. Community members have expressed a number of concerns. For example, those without livestock will no longer be able to collect dung for fuel from communal grazing areas; if cattle are no longer gathered in communal areas, breeding will be difficult; keeping livestock at home without sufficient fodder will require additional time and labour to search for feed; and those with less land worry they will be unable to provide for their livestock’s fodder needs. These are valid concerns which will need to be considered if the interventions are to be successful. 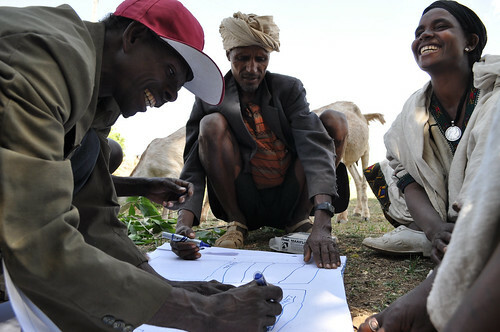 During the PV exercise local development agents were informally consulted in order to gauge why they think community members are reluctant to limit livestock movements. Many seemed bewildered and cited farmer ‘lack of awareness’ as a reason, but did not convey any of the reasons captured during the PV process. It is not certain what attempts, if any, have been made by development agents to understand these issues from the farmers’ point of view. Even though the PV process has enabled community members to voice their views to the platform, this does not guarantee that these views, and the diverse livelihood strategies and needs of community members, will be taken into account when developing and implementing the proposed interventions. Community members in the selected intervention area were not involved in the participatory video work so have not yet been sufficiently engaged and may not be aware of the innovation platform aims and activities. The platform members themselves will be responsible for working with them and although many talk convincingly about the need to include community members it is apparent that there is considerable variation in interpretations of what ‘participation’ means in reality. While tools such as PV can help to establish lines of communication between farmers and decision makers and prompt a degree of reflection, which is particularly important in areas where farmers are often perceived as ‘backwards’ by higher level actors, this is not enough. There still needs to be attitudinal change on the part of higher level actors and a willingness to listen to farmers’ views; broader changes in the culture of decision making among higher level stakeholders, particularly more flexibility in the planning and implementation of policy at local level; and an openness by community members to engage, although this requires trust to be established. None of this is easy to accomplish. In this particular situation, continuous engagement is required to build on the PV work and achieve more meaningful change. The video will be screened to the targeted community members to try and build trust and understanding of the innovation platform process. The next steps will bridge gaps between IP members and community members through practical engagement. This will include providing training and capacity building to platform members to further foster participatory approaches and encourage reflection on both the process and outcomes so far in order to consolidate learning. ILRI’s Beth Cullen was recently interviewed by the USAID Feed the Future Agrilinks web site about innovation platforms and participatory video. Ethiopia receives abundant rainfall but often too much comes at once leading to long periods of water scarcity and problems with soil erosion –interventions tend to be driven by decision makers and there is a need to find ways of giving local communities more ownership of the process. The CGIAR Challenge Program for Water and Food (CPWF) awarded a grant through its Innovation Fund to the Nile Basin Development Challenge (NBDC) to investigate and document the effectiveness of participatory video (PV) as a tool to bring local issues to the attention of planners and implementers of rainwater management interventions in Ethiopia. 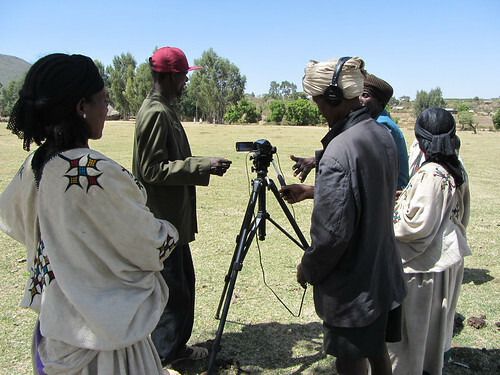 This month Beth Cullen (ILRI), Gareth Benest (InsightShare) and Aberra Adie (ILRI) trained a group of twelve farmers in Fogera woreda in Amhara region of Ethiopia for ten days in the use of video. Farmers were selected from three kebeles and consisted of six men and six women of varying socio-economic backgrounds. None of them had ever used cameras before. The aim of the exercise was to use participatory video to strengthen their voice in local innovation platforms. The formation of innovation platforms is part of the NBDC project. Rainwater management interventions in Ethiopia have historically been implemented in top-down fashion without due regard to the needs, aspirations, constraints and livelihood realities of local farming communities. Despite improvements to current Natural Resource Management policy there are several challenges to effective implementation, much of which revolves around issues of participation. Despite the rhetoric, community members are not often called upon to voice their opinions or take part in discussions about the policies that affect them. Instead there is a performance of ‘participation’ and as a result local realities of resource use rarely enter the decision-making process. It is widely acknowledged that for development interventions to integrate successfully with the lived realities of local peoples it is essential that they effectively address local understanding, needs and aspirations. The establishment of local innovation platforms comes from the recognition that improvements to farmer livelihoods and environmental integrity depend on wider institutions, markets and policies, rather than a narrow focus on changing farmer behavior. However, there is still an issue of how to engage with local communities and bring them into this process. Participatory video may be one way of doing this. In addition, Fogera suffers from ‘research fatigue’, like many places in Ethiopia. Farmers complain about researchers and development organizations asking questions but neither feeding back their results nor bringing any perceptible change. Perhaps surprisingly for an area where farmers are increasingly apathetic and indifferent towards research efforts there was full attendance throughout the PV training. Participants arrived early in the morning and waited for the training to start, maybe because it provided a welcome break from their usual activities. 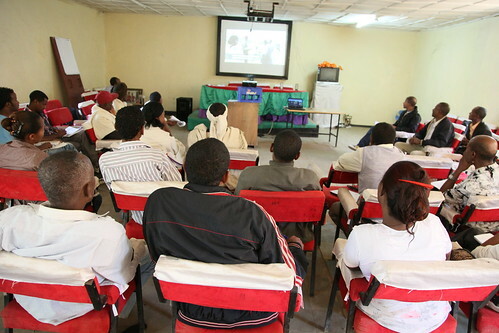 The training was based on the InsightShare approach to Participatory Video. Farmers learned basic video skills through games and exercises. The focus is on experiential learning, repetition and discussion. A key motto is ‘mistakes are great’. A range of PRA exercises were used to help the participants identify their main land and water challenges after which they highlighted specific issues and prioritized the subjects they wanted to document. In the process of learning to use the video cameras, they practiced recording one another as well as planning videos using storyboards. They then created final storyboards for their collaborative filming before heading out to film in their farms and villages. The resulting film is divided into three parts: the first on the issue of unrestricted grazing, the second on water stress, and the third on soil conservation efforts. During the training, participants were observed by government staff and development agents who often see rural farmers as ‘lacking awareness’, they expressed surprise that the participants were able to handle technical equipment. In this context PV can be used to challenge development agents’ attitudes towards farmers and can in turn help to empower farmers to recognize their own abilities and knowledge. The InsightShare approach is based on the premise that ‘farmers are the experts’ about their livelihoods and landscapes. The results of this approach can be seen in the marked increase in confidence of participants. Thus, the process is as important, if not more so, than the end result. Once the film was edited it was screened back to the participants for their comments. This gave them an opportunity to make any changes to the film before it was shown to members of the wider community in their three kebeles. The community screening was carried out partly to validate the messages in the film and to seek other points of view. The film received an overwhelmingly positive response from community members, who were also offered the chance to record and include their views. The next step is for the PV participants to present their film to members of the innovation platform who consist of local government administration, bureau of agriculture, national research institutes, a local NGO and community representatives. In the two meetings held by the platform so far, unrestricted grazing has been identified as a priority issue for action. This decision has been taken without significant input from community members who see the issue from a different perspective. PV has enabled participants to clearly articulate their views and it is hoped that this can provide a starting point for discussion and as such influence any future action taken by the platform, but this process will need to be monitored. Despite the benefits, PV is not a ‘silver bullet’ and is not necessarily appropriate for all situations and contexts. There is always a danger that the process can be misunderstood so it is essential that the aims are clear to all involved. If the aim is to convey community perspectives then there needs to be an understanding that this may include views that those at higher levels may not want to hear. It is also easy for the process to be hijacked. Video is an attractive medium and cameras have power but this power can be misused or misdirected, for example, to convey political messages or top-down objectives to farming communities thus reinforcing existing paradigms. The aim of PV is to give voice to the voiceless. PV offers a way of feeding views from farmers to researchers and decision makers, after which the intended audience can formulate a response thereby establishing a two-way communication channel. But this process alone is not enough. Opportunities and spaces need to be created whereby farmers can identify and determine solutions to their own problems as well as seek external assistance and access outsider knowledge. It has been shown that research and development approaches which actively involve farmers have a much greater chance of success. A constant refrain throughout the film is the importance of community decision-making. The film is titled ‘A Rope to Tie a Lion’ which comes from the Amharic proverb: ‘when individual threads unite, they can form a rope to tie a lion’. From 6 to 9 February, the secretariat of the Challenge Program for Water and Food (CPWF) organized a meeting in Montpellier, bringing together the six Basin leaders and six topic working group leaders. After two years in its second phase, the program is in full swing and a number of research outputs have already been highlighted on the CPWF website. After the first phase of the program, a whole series of outputs have been generated through intensive repackaging of the research results from the first phase (2002-2007). The key question highlighted comes at a crucial moment: the World Water Week’s annual theme is on ‘water and food security’, giving impetus for CPWF to show some results; the CGIAR research program (CRP) ‘Water, Land and Ecosystems’, a strongly related program, is just about to be launched and should build upon the CPWF; but more generally the current reform of the Consultative Group for International Agricultural Research (CGIAR) is urging all CGIAR centers to reconsider how the research they provide can better tackle poverty and contribute to wider development in a more integrated manner. By developing more research outputs from phase one and from the current phase, including a book and some policy briefs, furthering the repackaging work recently carried out by the global CPWF communication team. In terms of cross-basin interactions, Tilahun Amede has been working with other African basin leaders since the third International Forum for Water and Food to develop a sharing network and perhaps develop a book that captures experiences from the Limpopo, Volta and Nile Basin. Topic working groups might be modified to suit changing needs in the program. The exact composition and representation from the NBDC may also be affected by this change but it is unclear yet how this will pan out. Tilahun Amede is leading on one of the chapters planned for the end of program book and he should also provide support to another article directed by Larry Harrington. Communications, engagement and dissemination of scientific results are on the menu, more than ever. A recent NBDC meeting on communication – held on 24 February – partly addressed this need and came up with a series of recommendations to join up the different Nile project teams and to repackage existing research results with a keen eye for the information needs of specific audiences such as policy-makers, communities and other scientists involved in similar initiatives. With an upcoming team meeting – planned around the end of March – there will be more chances to join up the dots, locate and source the famous and sought after ‘science’ from CPWF. Less than two years of program remain, a seemingly distant date, but there is much work on the NBDC agenda and the whole team – scientists or not – are hard pressed to find the formula that guarantees strong scientific results without compromising the engagement and embedding process undertaken by the NBDC for the past two years.